June to August: De reis van de Drakenkeizer (The journey of the Dragon Emperor), ceramics, drawings and paintings at Galerie Van Slagmaat, Woerden. May to July: Ménagerie des Monstres, ceramics, drawings and paintings at gallery Untitled, Rotterdam. January to March: Circus rondom Bosch (circus around Bosch), KEG expo, Cultureel Centrum ’t Spectrum, Schijndel. From February Afterwar Delight and other ceramic sculptures at Diederiks Fine Art, Den Haag. July until January 2016 Dame en haar dwerg and other ceramic sculptures at Diederiks Fine Art, Den Haag. January to March: ‘Dutch Settlement’, gouaches, La Lanta Fine Art, Bangkok, Thailand. 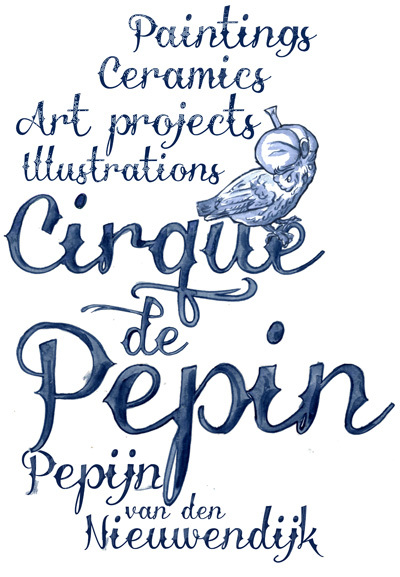 June to September: ‘Cirque de Pepin, The Greatest Show On Earth’, paintings, gouaches, ceramics, Koornmarktspoort, City Museum Kampen. Presentation: ‘Dragons of Ming’, Heden, Den Haag and presentation in February at ‘Art at the Warehouse’, Rotterdam. March: ‘Blik op de Lik’, exhibition with illustrations about work and life in prison, Gevangenismuseum Veenhuizen (prisonmuseum). ‘Tabletop’ presentation on my artist-in-residence in China in 2010 at STROOM centre for art and architecture, Den Haag..
January to March: ‘Er is eens…’ solo-exhibition headoffice Gasunie Groningen. April/May: Solo exhibition ‘Salon Printemps 2008’, KOCHXBOS gallery, Amsterdam. April to June: Solo-exhibition ‘Geschiedvernieuwing/Innovation of History’, in KOCHXBOS gallery Amsterdam. January/February: Solo exhibition Pulchri Studio. October 8 and 9, Filmhuis Den Haag. Solo exhibition at gallery MAMA Rotterdam. Februari-April Kunstparade, gallery Untitled, Rotterdam. March: Affordable Artfair Brussels, gallery Untitled, Rotterdam. April: Kunstrai, gallery Untitled, Rotterdam. April: Art Breda, gallery Untitled, Rotterdam. April-September: Tussen Kunst en Geschiedenis, Stedelijk Museum Coevorden. April: Een kleurrijk trio (A colourful trio), Cultuurplek, St. Willebrord. May-October beeldentuin/sculpturegarden Landgoed Anningahof Zwolle (ceramic sculpture Afterwar Delight). January: exhibition of paintings and ceramics with gallery Untitled (Rotterdam) at For Real Artfair Amsterdam. February: exhibition of paintings with gallery Nasty Alice (Eindhoven) at Rotterdam Contemporary Art Fair, Rotterdam. February-April: De cirkel is rond, new (round) paintings, Atelier Horneman, Groningen. May-June: drawings, ceramics and paintings in a groupshow with gallery Untitled (Rotterdam) at KunstRAI, Amsterdam. September: Art The Hague, gallery Untitled, Rotterdam, The Netherlands. November: Affordable Artfair Hamburg, gallery Untitled, Rotterdam, The Netherlands. February: presentation of paintings with gallery Nasty Alice at Rotterdam Contemporary Art Fair 2016. May: In het straatje van Vermeer, In Vermeer’s little street, groupshow with ceramics inspired by the painting The Little Street by Vermeer, Kerk op Hodenpijl, Schipluiden. August-September: Op visite in De Kreek, groupexhibition with sculptures, De Kreek ‘s-Gravenzande. March: presentation of gouaches with La Lanta Fine Art (Bangkok) at the AAF (Affordable Art Fair) Hong Kong. April: ‘The Blue Revolution, A witness of the maritime porcelain route, 400 years exchange’, Yuan Chonghuan Memorial Park Museum, Dongguan, China. Starting May 2014: permanent display, maquette of the city of Delft in ceramics, Museum Prinsenhof, Delft. May/June: ‘Jeux d’esprits: bleu, blanc, rouge’, at Pulchri Studio, Den Haag. October/November: ‘The BIG ART clash’, duo exhbition with Guus Koenraads, gallery Nasty Alice, Eindhoven. October/November: ‘The Blue Revolution, part 4, the gallery show at Cloud space gallery, Jingdezhen, China. October2014/March 2015: Daar komen de Putters!A homage to ‘The Goldfinch'(1654) painting by Carel Fabritius, Museum castle Keukenhof, Lisse. January to February: ‘DWARS’ group exhibition at gallery Nasty Alice, Eindhoven. March: ‘Untitled expo 3.0′, gallery UNTITLED, Rotterdam. April to June: ‘The Blue Revolution, Delft-Jingdezhen 400 years exchange’, Museum Prinsenhof, Delft. May: ‘Dutch settlement’, with Quartair artists at Enriched Bread Artists Studio’s in Ottawa, Canada. July/August: Ceramic sculpture Afterwar Delight at ‘Open stal’ 2013 ‘het landschap in mijn hoofd (the landscape in my head)’, Oldeberkoop. September: A selection of sculptures and paintings, opening Ababa, Rotterdam. October: ‘The Blue Revolution, Delft-Jingdezhen 400 years exchange’, Imperial Porcelain Museum in Jingdezhen, China. November: presentation of gouaches with La Lanta Fine Art (Bangkok) at the AAF (Affordable Art Fair) Singapore. November/December: ‘ARTWAR’, gallery Nasty Alice, Eindhoven. March/April: ‘New space’, group exhbition, KOCHXBOS gallery Amsterdam. April to October: ‘Kunst in de Lunette 2012′, sculpture exhibition with sculptures ‘Afterwar Delight’ and ‘Dame en haar dwerg’, together with artists Onno Poiesz and Bert Koerts, Sutfene healthcare facility, Zutphen. July: ‘Indigo Monsters’, exhibition of Cadavre Exquis gouaches and small ceramics sculptures together with artists Vipoo Srivilasa (Thailand/Australia) en Shin Koyama (Japan/Australia), La Lanta Fine Art, Bangkok, Thailand. September: group exhibition ‘Liefs, Vermeer (Love, Vermeer)’, in ‘Op Hodenpijl’ church, Schipluiden and the Vermeer Centre Delft. Group exhibition ‘Gathered through Facebook’, atelier Horneman, Ten Boer. Group exhibition gallery Nasty Alice, Eindhoven. October 2012 to September 2013: Participant in the exhibition ‘Delfts Blauw. Kunst of Kitsch’ with the large vase ‘Perpetua Porseline’, museum Prinsenhof in Delft. April spring exhibition Pulchri Studio, Den Haag. May/June ‘400 years Exchange Delft-Jingdezhen’, old city hall Delft. May to October exhibition sculpture garden Landgoed Anningahof, Zwolle. Ceramics in the San Bao museum, permanent display, Jingdezhen, China. October 2011 to Januari 2012: group exhibition ‘Werkelijke fantasieën’ (Real fantasies)’ Atelier Horneman, Ten Boer. March: ‘GROW UPS’, group exhibition at The center for creative communications (CCC) in Shizuoka, Japan. March: ‘DREAMSCAPE 2010’, group exhibition at Loods 6, Amsterdam. April/Mei voorjaarstentoonstelling Pulchri studio, Den Haag. with ‘Dame en haar dwerg’ ceramic sculpture and some smaller ceramics. September: ‘3 stories up, group exhibition’, Cabinodd gallery, Enschede. September to October: ‘Instinct 2’, group exhibition, ATH Gallery, Ulvenhout-Breda. October: Affordable Artfair 2010, group exhibition at KOCHXBOS gallery and ATH gallery (paintings). November: ‘Verhalenboek’, group exhibition, ATH Gallery, Ulvenhout-Breda. January: ‘Jong & Dynamisch’, group exhibition Pulchri Studio. April: ‘Kites for Kids’, exhibition of kites, organised by Pulchri studio, Atrium city hall Den Haag. June: ‘Kunst is zilver, gas is goud – Gaswerken van Gasunie’ at Kunsthal of Slochteren. May to October: exhibition sculpture garden Landgoed Anningahof, Zwolle, with small ceramics. May to October 2009: Participating in the sculpture exhibition at country seat Tessloo, Oisterwijk, with“Dame en haar dwerg” ceramic sculpture. Till October 2009: Participant ‘De Heemtuin verbeeld II’ exhibition at De Heemtuin, Leiderdorp, with ‘Afterwar Delight’ ceramic sculpture (October 2008 – October 2009). October: Affordable Art Fair (AAF), with KOCHXBOS gallery, Amsterdam. December to January 2010 Winter group exhibition KOCHXBOS gallery, Amsterdam. February: ‘Grow-ups’ group exhibition CBK Flevoland, Almere-haven. March: ‘Metal Heart’, group exhibition Planet Art, Amsterdam. June: Opening Holland Museum at Fule International Ceramic Art Museums (FLICAM), Fuping, China, ceramic intallation ‘The awakening of the mouse, Lao Shu’. June to September: Participant in ‘Contrasten’ sculpture exhibition at castle-museum Sypesteyn, Loosdrecht, with ‘Afterwar Delight’ ceramic sculpture. May to October 2009: Participant in sculpture exhibition at country seat Tessloo, Oisterwijk, with ‘Dame en haar dwerg’ ceramic sculpture. October: Participant in ‘De Heemtuin verbeeld II’ exhibition in De Heemtuin, Leiderdorp, with ‘Afterwar Delight’ ceramic sculpture (till October 2009). September: 2008 Jingdezhen China International Contemporary Ceramic Exhibition. April: ‘Ars Macabra Holandica’ group exhibition, ABC Treehouse gallery, Amsterdam. May to October: exhibition sculpture garden Landgoed Anningahof, Zwolle, with ‘Afterwar Delight’. June/July: ‘Abklopfen & Neuputzen’, group exhibition, Livingstone gallery, Den Haag. September: ‘Outsiders’, group exhibition, Electron, Breda. November: AAF Affordable Artfair, Westergasfabriek, group exhibition KOCHXBOS gallery, Amsterdam. May/June: group exhibition ‘De gebakken strip’, Keramikos, Haarlem. September/October exhibition ‘Choosing my Religion’ (Showroom MAMA), Artfair ‘Preview Berlin’ Backfabrik, Berlijn. Augustus to November: exhibition ‘Cultuurlab II – Wat je weggooit, ben jezelf’, Limburgs museum, Venlo. July/August: ‘Groeten uit Delfshaven’, Follow the white rabbit, Delfshaven, Rotterdam. June/July: group exhibition at SAG Contemporary Art Agency, Antwerpen. May to July: ‘Prettier in pink’, Follow the white rabbit, Delfshaven, Rotterdam. January: group exhibition ‘Neotrad’ at Showroom MAMA, Rotterdam. June: Presentation of new Artoonist ceramic sculptures, made at EKWC (European Ceramic Work Centre), at De Briljantine Arm, Rotterdam. October: Participant in the fall exhbition at Pulchri Studio, Den Haag. February/March: ‘Up the hill Backwards’, group exhibition about David Bowie, Stip galerie, Amsterdam. June/July: group exhibition ‘Gekken ontdekken verf’, 9 years artwork from magazine Zone 5300, VBKD, Dordrecht. July/August: group exhibition ‘BRUUT’, at Showroom MAMA, Rotterdam. the three other Artoonist artists Hans van Bentem, Luuk Bode and DJ Chantelle at Showroom MAMA, Rotterdam. celebrating 5 years MAMA, Showroom for Media and Moving Art. Group exhibition ‘Rembrandt 2000’, Kneuterdijk, Den Haag. Group exhibition ‘Clash!’ at Museum Kunsthal, Rotterdam. Media and Moving Art, Rotterdam. April: design, decoration and co-curator for the exhbition ‘The Blue Revolution, A witness of the maritime porcelain route, 400 years exchange’, Yuan Chonghuan Memorial Park Museum, Dongguan, China. February to May: implementation maquette of the city of Delft in ceramics, Museum Prinsenhof, Delft. October: Design of booth for UNIC, urban Network for Innovation in Ceramics, commissioned by city of Delft, ‘China Jingdezhen International Ceramic Fair’, Jingdezhen, China. April: design, decoration and co-curator for the exhbition ‘The Blue Revolution, Delft-Jingdezhen 400 jaar exchange’, Museum Prinsenhof, Delft. October: design, decoration and co-curator for the exhbition ‘The Blue Revolution, Delft-Jingdezhen 400 years exchange’, Imperial Porcelain Museum in Jingdezhen, China. October: design of decoration of booth for UNIC, Urban Network for Innovation in Ceramics, commissioned by city of Delft, China Jingdezhen International Ceramic Fair, Jingdezhen, China. January to May: ‘Drakendoos’ – ‘Dragonbox’, commission for 25 Delfsblue ceramic dragons in ceramic boxes for Accezz International BV, Delft. September: ‘De koepels van de Orient’ (‘The domes of the Orient’). ceiling painting of three domes at housing complex “De Orient”, Den Haag. October: design for the ‘Delft – Jingdezhen 400 year city connection’ booth at the China Jingdezhen International Ceramic Fair, Great China Museum, Jingdezhen, China. October to December: ‘The dragons of Ming’, commission for 50 Delftsblue cermaic dragons on ceramic islets, Heden, Den Haag. August/September: Urban Explorer festival, series small robots ‘My little Urban Explorers’ in the public space of the Roombeek district, Enschede, commissioned by Tetem Enschede. Ceramic relief ‘Feyenoord’, commissioned by counsil Feyenoord Rotterdam. Ceramic sculpture ‘The three Tsarina’s of the underground Kingdom’ commissioned by Gasunie. Ceramic sculpture ‘Ketelbinkie en het Paard van Troje’, Schiedamse Vest Rotterdam. ‘Een droom van de toekomst’ (‘A droom of the future’), 4 ceramic reliefs for district Waterrijk, Woerden. October: bronze price for the design of the “Delft – ‘Jingdezhen 400 year city connection’ booth at the China Jingdezhen International Ceramic Fair, Jingdezhen, China. Basic stipend Fonds voor Beeldende Kunsten (Foundation for Visual Arts). Starter stipend Fonds voor Beeldende Kunsten (Foundation for Visual Arts). October: Artist in residence, Ceramic Institute San Bao, Jingdezhen, China, at the invitation of the City of Delft in the context of ‘400 years of sister city connection Jingdezhen-Delft’. Artist in residence at Fule International Ceramic Art Museums (FLICAM), Fuping, China, production of the ceramic installation ‘Het ontwaken van de muis, Lao Shu’. February to May: Artist in residence at EKWC European Ceramic Work Centre, Den Bosch. Teacher art at Zebra Foundation, several schools, Den Haag. Workshop Majolica (ceramic) painting, BK 050. Teacher ‘Kunstplan’ (‘Artplan’), Koninklijke Academie van Beeldende Kunsten, Den Haag (Royal Academy). Several illustrations for magazine Balans (Dienst Justitiële Inrichtingen, DJI. Several illustrations in bookazine DUF. Several illustrations for magazine Ctrl of the Inspection Transport and Water. Illustrations for magazine Global Dutch. Illustrations for multicultural cookbook commissioned by DeVersiering Foundation. Several illustrations for magazine KPN Nu, KPN Telecom BV. Illustration in magazine Internet in Business. Illustration for VPRO television guide cover. Graphic design of invitations for Quartair, Contemporary Art initiatives, Den Haag. establishment of computer company Intel. Work at designstudio Flying Dog, Den Haag.